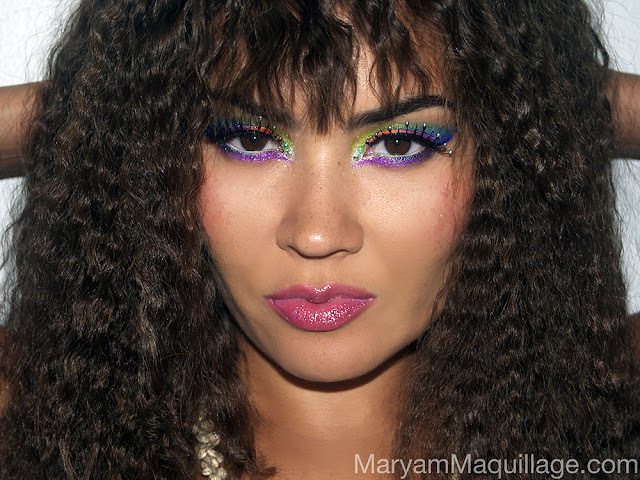 Maryam Maquillage: Back to the Splash! How I wish I could go back in time and live through the 1980's as an adult!! I love everything about the 80's; from the music to the HAIR to the makeup to the crazy fashion. Alas, I'm a Millennial kid and can only relive my favorite era vicariously through my hair and makeup, so, with today's look, I'm paying homage to Splash and going forward to the past! All shades have a metallic shimmery finish with loads of sparkle, but never any fallout. 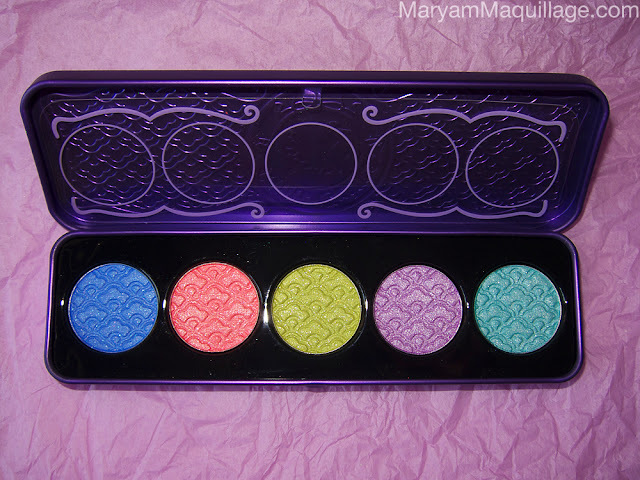 This palette is my favorite of the Lime Crime palettes. I adore LC's previous (mostly) matte palettes, but this 100% shimmery collection is just magical. I'm drawn to every color -- they are just as stand-out and beautiful when worn alone as they are in combination with one another. There are tons of eye makeup possibilities with Aquataenia and that's why I'm officially claiming it as my #1 summer palette! 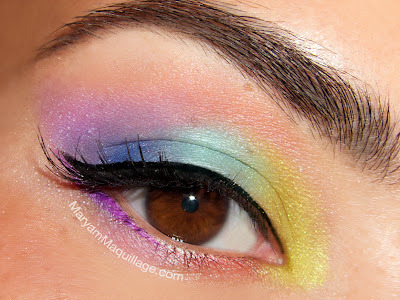 I used all the five shadows in the Aquataenia palette and lightly dusted them onto my lids. No other products were used underneath to enhance the colors, just LC's eyeshadow primer. My liners are Quill (black) and Orchidaceous (purple), also by Lime Crime. Always use a good primer underneath. Shimmery eye shadows tend to highlight the texture of the skin, and a prepped "canvas" will result in a smoother finish. Just like in art! Apply the shadows using patting motions, never use swiping strokes. Blend them by layering. Unless you're going for a mermaid look, make sure to add a few neutral matte shades in the crease and in the outer corner. You've heard this before, and I'll say it again, you don't want to look like a disco ball... unless of course you want to. Balance your sparkly look with dark eyeliner and falsies, the sharpness of the two will pull the look together. Unbraid the hair and VOILA! LeeLee thought this image was badass, so I'm leaving you with it :)) What do you think, am I mermaid material? Will you be creating your own Summer "Splash" moment? Looks really mermaidy :D Love it, love your hair!! And it looks like you put alot of work and time in this look! Very pretty! I love the little diamonds! And your hair is GORG! How'd you make is look so crimpy?? Thanks my lovely!! Yes, it's my favorite way to "crimp"!! 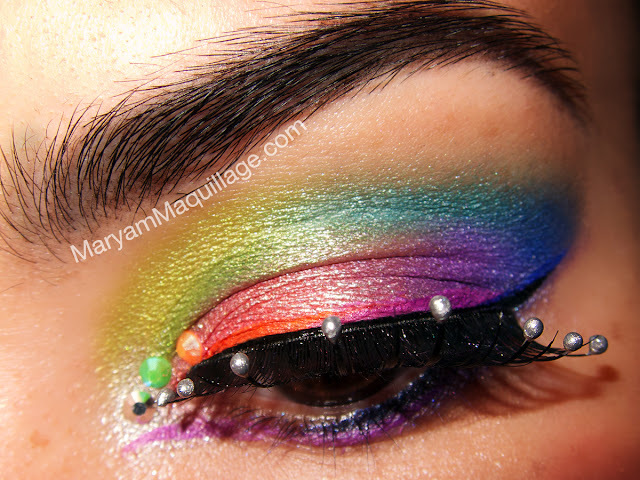 I looooove this colorful look and those lases are too cute! 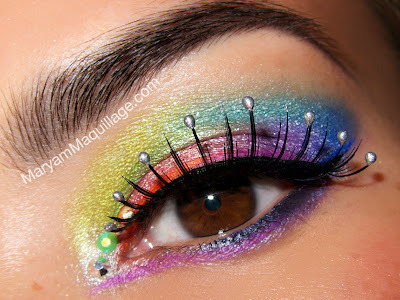 Just looked at their site, they have a HUGE selection of lashes I must order some!! Love the summery mermaid feel, it's so gorgeous, I love it!!!!! yay you look just amazing! and this lip gloss is so beautiful! Loveeeeeeeeeeeeeeeeeee this look wow you did great what an amazing interpretation of this look! Wow!!! And your blending is amazing! Love you hair! Splash is one of my all time fave movies. I love it! One of your best looks. Omg..you look gorgeous! So talented! very cool- I love that movie. I saw it as a kid and a month ago they showed it on cable so I watched it just for the childhood memories. Love the look so much!! Hey, you look gorgeous, I LOVE your hair!!! You can pass off for a mermaid ;) Your hair look fab! Best looking mermaid ever, Ariel better hide! I am really liking the purple liner under the eyes. There's something so appealing about purple! Thanks so much :)) I love bright colors!! It's so aquatic! I used to watch Splash all the time when I was little! Wow this is sooo cool! Great blog! very cool! You definitely are giving out a mermaid circa '80s feel so you're doing it right!! haha Actually, for some reason I'm even getting a bit of Katy Perry from this looks, random, I know. Love your use of colour, you always blow me away! Those lashes are so interesting.. I'd like to try them out myself! Thanks sweets!! I kinda see Katy... maybe i'm channeling her energy hehe... yes, the lashes are amazing, you'd love them!! you never disappoint!! this is so gorgeous! Great colours!! The make up is so cool!! 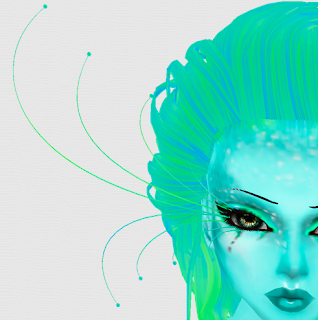 Maryam "Mermaid" Maquillage: You will make a magnificent,magical,mythical, mysterious,mesmerizing mermaid. Why don't you get yourself a colorful mermaid tail fin and matching top and appear as a real mermaid. I would love to see that. hey , just i found your blog and i love it !!! :D is awesome ! this look is so lovely !!! :x is for summer sure !!! Gorgeous gorgeous gorgeous! The lashes are the perfect finishing touch! You never ceases to stop amaze me with your creativity and your talent! This one is just to damn cool and you totally rock as a mermaid!